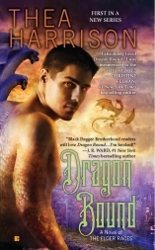 In Reviews, Romance, Romantic suspense. A satisfying romantic suspense with a capable heroine. The romance lacks intensity, but a decent mystery plot keeps the pages turning. The thing about Nora Roberts is that I almost always enjoy her books—just never enough to want to buy her next one and let’s not even contemplate her backlist. Chasing Fire is no exception. Rowan Tripp is an experienced firefighter with the US equivalent of the rural fire service, but it’s a little different this time. She lost a jump partner in a freak accident the previous season, and it seems someone has put the blame squarely at her feet. There are a pool potential suspects, even though Rowan isn’t comfortable thinking that any of them could be capable of sabotage and murder. Aside from staff at the base station, there’s her fellow fire fighters, who rely on each other’s trust for survival. There’s also the newest batch of smoke-jumping recruits—firefighters who get flown into a middle of a bush fire. One of these recruits is Gull Curry—perhaps one of the least romantic names I’ve seen in the genre—who is immediately attracted to Tripp’s ‘package’ and ‘attitude’. Curry’s a nice guy…and remains so throughout the entire book. The romance develops gradually, but it’s not quite central to the story. It’s nice to have, but not essential. More interesting are the secondary characters, even though there are so many of them it’s sometimes tricky to get them straight. Roberts likes to play around with stereotypes, and this is refreshing to read—the hot blonde who loves shoes but can complete an obstacle course, the sexist redneck who concedes he’s wrong about women smoke-jumpers. There’s a lot of camaraderie in the team, which Roberts captures very well. After several attempts at reading Roberts’s contemporary novels—including her Chesapeake Bay saga, which seems to be universally recommended by everyone who recommends her work—I think we’ll have to chalk it down to a matter of style and personal taste. She writes gutsy, empowered heroines and heroes who support rather than dominate. I love this; I do. But for some reason, Roberts still fails to move me. In Chasing Fire I can understand why. Much of the book focuses on Rowan’s development and in solving the murder mystery. These are interesting parts of the plot and Roberts doesn’t make it easy to guess the culprit—she throws enough seeds of doubt that you’re kind of almost sure you know who it is, but you kind of maybe think you’re wrong. So perhaps it’s the romantic suspense subgenre I struggle with. The more I consider this idea, the more it makes sense. But that would require a post of its own. Chasing Fire is a satisfying romantic suspense with a capable heroine. The romance lacks intensity, but a decent mystery plot keeps the pages turning. A review copy of this book was generously provided by Hachette Australia. 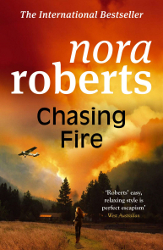 Tagged 2011 releases, nora roberts.